Amidst the flak that diesel vehicles are receiving, thanks to the Dieselgate scandal, Mercedes-Benz continues to uphold its integrity when it comes to offering fuel-efficient and environmentally-friendly products. Recently, the brand received an environmental certificate for the Mercedes-Benz A-Class, which reaffirms their compliance to environmental standards. The recipients of the certificate are the A180d and A200 models of the A-Class. As a recap, the A180d hatchback’s European specs claim that it has a combined fuel consumption of 4.5-4.1 l/100 km, and its combined CO2 emissions is 118/108 g/km. On the other hand, the A200 boasts a combined fuel consumption of 5.6-5.2 l/100 km while its combined CO2 emissions is at 128-120 g/km. The Environmental Certificate was given by the TÜV Süd (German Technical Inspection Authority). The tests conducted by the experts of the agency examines the environmental impact of the auto over its full life cycle. The life cycle assessment does not only evaluate the use of fuel and carbon footprint of the vehicle, it also checks the emissions produced during its production and recycling phases. 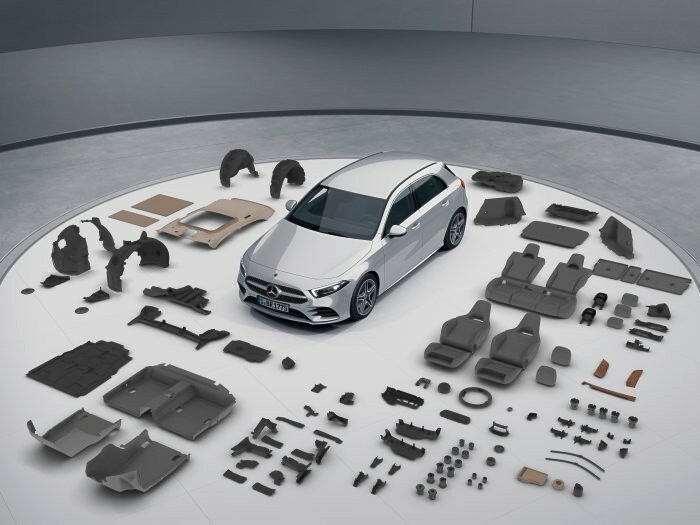 According to the Global Media Site of Daimler AG, the A-Class uses plenty of renewable raw materials and recycled plastic. These include the reinforcing frame of the sunroof that is composed of a mix of thermosetting bonding agent and natural fiber mat, wheel arches from reprocessed starter batteries and bumper panelling, and Dinamica in the cabin that comes from high-quality secondary raw materials. The environmentally-compliant components do not only save resources, but they also cut the weight of the parts where they are used in half.